The association of Paleo-Indian artifacts with extinct Pleistocene mammal remains in various archeological sites within in the Texas Prairie-Savannah Region of eastern North Central Texas, including a site in Collin County and Clovis points recovered from the Brushy Creek Clovis Site in Hunt County, demonstrates that Rockwall region was occupied by prehistoric Native American cultures at least as far back as 13,500 to 13,000 years ago. More recently, the Rockwall region was occupied by Caddo Indians. Creek Indians moved to the area in the early 19th century. The town was established April 17, 1854 and named after these natural rock walls. While originally part of Kaufman County, in 1873, Rockwall County was formed with Rockwall being the county seat. According to the United States Census Bureau, the city has a total area of 31.6 square miles (82 km2), of which, 22.3 square miles (58 km2) of it is land and 0.4 square miles (1.0 km2) of it (1.63%) is water. Rockwall is on the east shore of Lake Ray Hubbard about 20 miles northeast of Dallas. It is on state highways 205 and 66, north of Interstate 30. The climate in this area is characterized by hot, humid summers and generally mild to cool winters. According to the Köppen Climate Classification system, Rockwall has a humid subtropical climate, abbreviated "Cfa" on climate maps. As of the census of 2000, there were 17,976 people, 6,605 households, and 5,158 families residing in the city. The population density was 806.9 people per square mile (311.5/km²). There were 7,089 housing units at an average density of 318.2 per square mile (122.8/km²). The racial makeup of the city was 91.35% White, 3.00% African American, 0.38% Native American, 1.39% Asian, 0.03% Pacific Islander, 2.57% from other races, and 1.28% from two or more races. Hispanic or Latino of any race were 6.44% of the population. There were 6,605 households out of which 39.4% had children under the age of 18 living with them, 66.8% were married couples living together, 8.7% had a female householder with no husband present, and 21.9% were non-families. 18.6% of all households were made up of individuals and 5.4% had someone living alone who was 65 years of age or older. The average household size was 2.68 and the average family size was 3.06. In the city, the population was spread out with 27.5% under the age of 18, 6.9% from 18 to 24, 30.9% from 25 to 44, 25.1% from 45 to 64, and 9.7% who were 65 years of age or older. The median age was 37 years. For every 100 females, there were 95.5 males. For every 100 females age 18 and over, there were 92.1 males. The median income for a household in the city was $65,411, and the median income for a family was $75,121. Males had a median income of $55,370 versus $35,139 for females. The per capita income for the city was $29,843. About 3.2% of families and 3.9% of the population were below the poverty line, including 4.6% of those under age 18 and 3.0% of those age 65 or over. Though Rockwall County is the smallest county in Texas, it is also one of the top five fastest-growing counties in the United States. As of the 2006 census by the North Texas Central Council of Governments, the city had a population of 29,500. 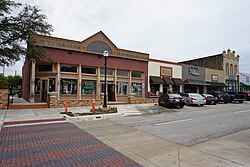 In 2006, Rockwall County was the fastest-growing county in the United States by population. According to the city’s most recent Comprehensive Annual Financial Report Fund Financial Statements, the city’s various funds had $39.0 million in Revenues, $42.2 million in expenditures, $32.3 million in total assets, $3.6 million in total liabilities, and $25.9 million in investments. The city of Rockwall is a voluntary member of the North Central Texas Council of Governments association, the purpose of which is to coordinate individual and collective local governments and facilitate regional solutions, eliminate unnecessary duplication, and enable joint decisions. Rockwall is represented in the Texas Senate by Republican Bob Hall, District 2, and in the Texas House of Representatives by Republican Justin Holland, District 33. At the Federal level, the two U.S. Senators from Texas are Republicans John Cornyn and Ted Cruz; Rockwall is part of Texas' US Congressional 4th District, which is currently represented by Republican John Ratcliffe. The city is served by the Rockwall Independent School District. There are two public high schools in Rockwall: Rockwall High School and Rockwall-Heath High School. The city is home to the Higher Education Center at Rockwall, which is part of the community college district, Collin College. The campus is the District's first campus outside of Collin County itself. Texas A&M University-Commerce holds classes at the Center. Texas A&M University-Commerce also has a campus located at the Rockwall Technology Park. Ralph M. Hall/Rockwall Municipal Airport is located two miles east of the city and is used mostly by small general aviation aircraft. Rockwall offers many different sports complexes as well as activities. For example, Lake Ray Hubbard has several boating marinas and is used for jet skiing. Rockwall also offers 22 different Golf Courses  within 17 miles of the center of Rockwall. Alex Jones, conservative radio show host and conspiracy theorist who grew up in Rockwall during the 1980s and early 1990s. In 2018, Jones claimed Rockwall High School cheerleaders tried to lure him into Satanism. Marina Oswald Porter, widow of Lee Harvey Oswald. ^ a b c "State and County Quick Facts". United States Census Bureau. Retrieved May 14, 2015. ^ a b Monroe, J.N., 1950, Origin of the clastic dikes in the Rockwall area, Texas. Field and Laboratory. v. 18, no. 4, pp. 133-143. ^ a b Ellwood, B.B., J. Payne, and G.J. Long, 1989, The Rockwall, Texas: A study of unusual natural magnetic effects in geoarcheological surveys produced by mineral oxidation. Geoarchaeology. v. 4, no. 2, pp. 103-118. ^ Crook, W.W. III, M.D. Hughston and J.L. McCraw, 2009, The Brushy Creek Clovis Site (41HU74): An Early Paleoindian Occupation in Hunt County, Texas. The Record, Dallas Archeological Society 56(1):1-18. ^ Crook, W. W., III, 2011, A Possible Association of Worked Flakes with Probosidian Bones near Lake Lavon, Collin County, Texas. Archeological Journal of the Texas Prairie-Savannah 1(1):4-8. ^ Ferring, C.R., 2000, The Archeology and Paleoecology of the Aubrey Clovis Site (41DN79) Denton County, Texas. Center for Environmental Archeology, Department of Geography, University of North Texas, Denton. ^ "Comprehensive Annual Financial Report" (PDF). September 30, 2014. p. 132. Retrieved April 24, 2015. ^ "Senator Bob Hall: District 2". Archived from the original on March 12, 2015. Retrieved April 24, 2015. ^ "Texas House Member". Retrieved April 24, 2015. ^ Cliff Harris Football All-time Great & Author Retrieved 2018-04-16. This page was last edited on 23 February 2019, at 23:45 (UTC).